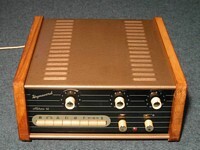 This is a very, very rare amp from Dynacord. 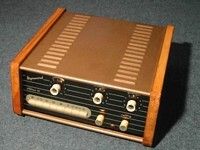 Dynacord was founded in 1945 (the brand name appeared later in 1948). The company started with smaller amplifiers and cinema amps and became famous for its musical instrument amps and public address systems. A great history can be found (also in English) at www.dynacord.de. 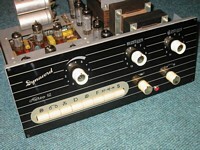 The HiFi / stereo amps made by Dynacord are ultra rare and I have only seen the “ST12” tube amp twice in over 20 years. 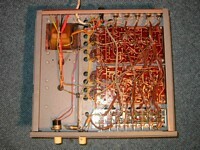 The amp shown on this page has date stamps from 1959 and 1960. 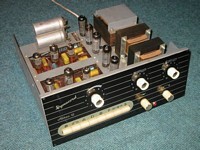 I think that this is one of the earliest German stereo amps. The amp is not absolutely free from surface noise, but sounds fantastic - very holografic with a deep, controlled bass (big, oversized output transformers). 12W measured output power !!! 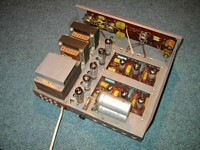 The “ST12” is a 12 watts/channel integrated amp using EL84s in PP mode with ECC83 driver stage. 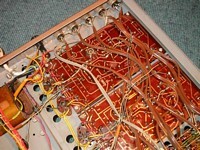 The input and driver stages are mounted on a printed circuit board (of good quality) and – gooood – the output tube sockets on the chassis. 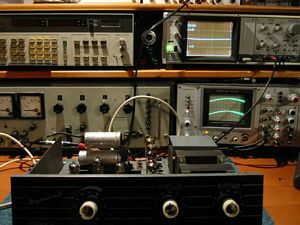 The power supply uses an EZ81 tube - very nice and good working with the EL84s. 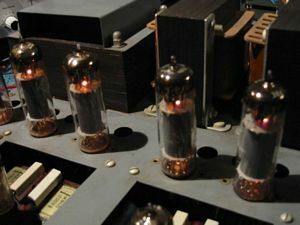 We find two pretty extraordinary (for HiFi amps) tubes in this amp: the EF80 as driver and the EC92 as phase splitter tube. The frequency response is very linear. The amp should be used without cabinet as it gets very hot in it. Before powering up the unit you should check the original coupling caps as they tend to leak.